A seminal record of the mid-80s New York radio and club scene, ‘Nobody’s Business’ was originally a 1920s blues standard by Porter Grainger, sung and recorded by many, including another Billie – a certain Ms Holiday. Boyd Jarvis took the hook and changed some of the lyrics, turning the song into an uplifting house anthem. Considered almost sacred to regulars at Paradise Garage, it became a staple for Larry Levan, cherished by all who heard him play it. 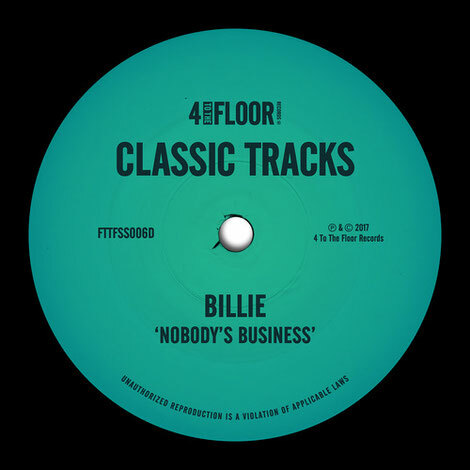 Like much of the proto-house music that was released in the mid-80s, the message and delivery on 'Nobody's Business' is overwhelmingly positive and inspiring, with an arresting performance from Billie. Emotive, inspirational and entirely heartfelt, this is a great tune. It’s out 28 July on 4 To The Floor.